Croacia es un país de las maravillas de la historia y la belleza natural. En este Split Super Saver, regrese al siglo IV dC con una visita guiada al magnífico Palacio de Diocleciano en Split. 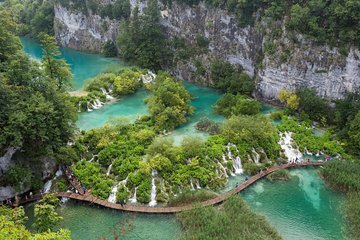 Luego, pasa otro día en el impresionante Parque Nacional de los Lagos de Plitvice. Con una guía bien informada, usted podrá deambular por los senderos del bosque; Contempla las vívidas aguas turquesas; Y disfrutar de paseos en barco eléctrico, autobús y tren. Paseo a pie de 1,5 horas por el Palacio de Diocleciano, declarado Patrimonio de la Humanidad por la UNESCO. Empápate de los alrededores con un recorrido panorámico en autobús o en tren eléctrico. Este tour combina dos de las atracciones más populares de Croacia en un precio accesible y con descuento. National park is excellent. Must see but no necessary to join in the walking tour in a town. Very boring. Plitvice Lake tour was amazing...... well worth the long day. Haris, our guide is really nice and always smiling. We were not able to do the Walking Tour of the Diocletian's Palace due to time restraints but thoroughly enjoyed our day at Plitvice Lakes. This is a beautiful park and our guide was knowledgeable and friendly. Pick-up was easy at the South Gate and the ride to the destination was picturesque and pleasant. A quick stop was included for refreshments before entering the Park. Recommend comfortable shoes as there is a lot of walking. Would highly recommend. The tour company is so horrible. The meeting up time is between 7-8 am in the morning. I already arrived the meeting point on 7:15, and stood and waited at the meeting point for around 45 mins in the rainly day, but noone appeared. Then i called the company. The staff just said that you are late. He tour already gone .Sorry,i cant help you,then hang on my call!!! !PLEASE DON'T BOOK THIS COMPANY, the price is expensive than the local tour in split. The walking tour was a nice introduction to Split and the city's history. The day trip to Plitvice was great, we spent about 4 hours in the park and did a lot of walking.